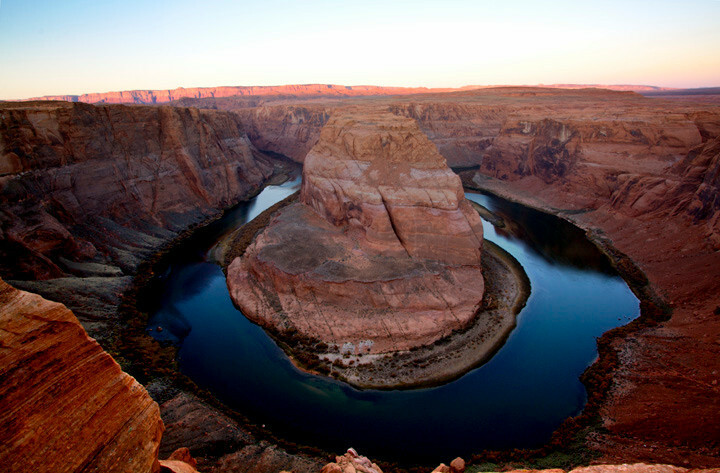 This was taken on a very chilly morning at the horseshoe bend in Arizona. I went out there in a thin jacket with all my gear but no gloves. I thought that it will get hot when the sun rises and so it wouldn't matter. I was so wrong :(. It might have been getting hotter when the sun rose, but for me, specially for my fingers, it was getting colder and colder. The sky did not do anything dramatic, but the mountains in the distance were lit bright red due to the early sun. Got a few shots before making my fingers completely cold, numb and useless. Took a long time after reaching back to the hotel to regain sensation in my fingers. But overall, I could capture the place during sunrise and it was a good lesson learnt.